Top » Why change propeller ? 1- Propeller : an accessory ? 2- Why all propellers do not meet the good specifications ? 3- Do you have the right propeller ? 4- And why not an E-PROPS ? It is an essential equipment, indispensable, exactly as the aircraft structure and as the engine. A light aircraft or an ultralight cannot take-off or cruise without propeller. - If its efficiency is bad, this will affect the performances and the fuel comsumption of the aircraft. - If it has not been well designed and calculated, if it is bad manufactured or it has too many parts, the risks could be significant (loss of the pitch, loss of a blade, even loss of the propeller). - If it is bad balanced, this could cause vibrations. Vibrations could be dangereous for other parts of the aircraft (reducer, engine mount, silent-blocks). - If the propeller is fragile, or if it could damage over time, the repairs could grounded the aircraft. - If it is noisy, this could degrade the confort for the pilot and his passenger, and also the relationship with the neighbours. - If the propeller is heavy, this will affect the mass of the aircraft, and could weigh above the limits on the reducer. Those characteristics are essential to obtain the perfect propeller. Furthermore, the propeller must be nice, because "a beautiful plane is a plane which flies well". A propeller should be : efficient, light, simple, well-designed, silent, well-manufactured, strong, aesthetic and well-balanced. This is certainly not always the case. Why ? 1- The propellers manufacturers are using concepts and profils developed since more than 50 years. The geometries of the wooden blades have practically not changed since 1960. The blades of different composite blades are often copied from each other : if you put some of them next to the others to notice strange similarities. 2- The traditional propellers manufacturers are doing very little real researches on profiles, chords and positioning of the blades. They are making an "universal" blade, which is more or less adapted to all types of engines, with a diameter which would be cutted as wanted. They develop a manufacturing process as cheap as possible, and then do not touch anything during years, in order to get the biggest return on their production line - even when the manufacturing process does not ensure a whole reproductibility... And regarding the efficiency... Which manufacturer tests then publishes comparative technical data of its propellers ? In order to have the best performances of a propeller, each blade has to be especially developed for one engine, one gear box, one diameter, a speed range of the aircraft and a defined configuration. The propeller is necessarily a custom-made product. However, most of propellers manufacturers have only some blades designs in their catalogs. 3- Static and dynamic balancing seem essential at the end of a propeller's manufacturing : it is amazing to see how this process is neglected by the most of the propellers manufacturers. Some of them are manufacturing balanced blades' sets, but do not verify the balancing of the complete propeller. 4- Works on noise reduction are not common since 1940. If you keep the same geometries, the samed chords, the same blades' number and the same positioning of the blades, it is a fiction to imagine to reduce the noise made by the propellers. 5- The goal of a manufacturer is generally not to propose the stronger product as possible, because he has to ensure to keep a renewal or repair market. How explain that many composite propellers are protected with a gel-coat, nice and gloss when the propeller is new, but which will be damaged very fast on the leading edge, and which will not be repairable, except by the manufacturer. Other manufacturers mix materials as carbon and aluminium, without taking into account the galvanic corrosion. Other are making their hubs in cast alumimiun, with the big risk of skin marks, and therefore a very limited life. 6- The lack of recent researches on propellers for leisure aviation and on their manufacturing process leads the manufacturers to propose heavy products, even very heavy. Some propellers weight up to 18 kg ! Very stange in the aeronautic field, where the lightness is imperative, for obvious physical reasons, and not only to adapt to regulation. 7- Many propellers blades have been developed to adapt on many engines : they are massive, huge, and finally disproportionate with respect to the fine ultralights. fin or large blades ? Which are really the most beautiful ? "Do my present propeller, the one which allows my ultralight to take-off, climb and cruise, meets those essential specifications ? Is it : efficient, light, simple, well-designed and well-manufactured, silent, strong, aesthetic and well-balanced ? ?" NO ? It is time to change ! * You have no time to change your propeller ? Choose a simple propeller, with a good manual; so you just need 2 hours for assembly and pitch adjustment. * You don't have the budget for a new propeller ? An efficient, new, solid and safe propeller, costs less than 2% of the total price of a new ultralight, and less than 5% of the amount of a second-hand mid-range ultralight. Sometimes you have to make some choices : a good propeller is essential, some accessories not. * The aircraft manufacturer has chosen my propeller : that's the best choice for my aircraft. Yes - and no ! An aircraft manufacturer has not always the time and the possibility to test all propellers on the market. This model is perhaps the one which he has made all certification tests (and he doesn't want to make them again - we can understand ! ), or the one on which he has the best margin... The manufacturer choice is not always the best technical choice, because we are not in a perfect world. * You don't know what propeller you should choose ? 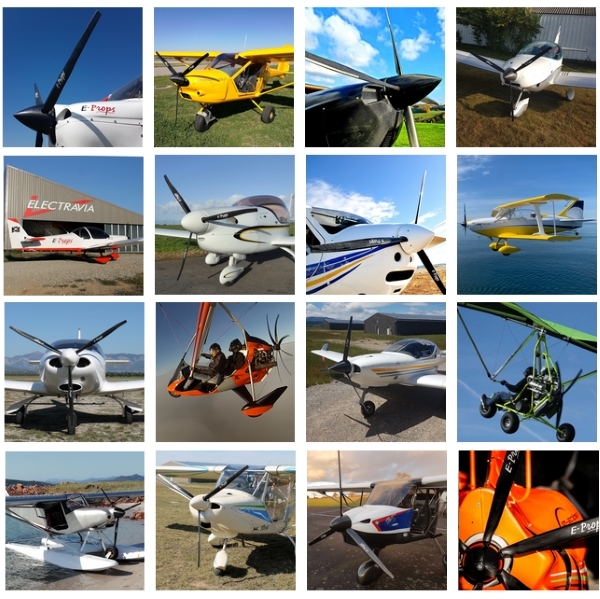 All propellers manufacturers are saying the same thing : their propellers are the best, the stronger, the more silent. Of course. Same by E-PROPS ! Perhaps you have to favour a propeller manufacturer who will give proofs, and be sure that you can give the propeller back and be reimbursed if this model does not suit you. new aerodynamic designs become possible. High CL profiles, narrow chords, very big diameters, positions of the blades... The numerical modelling studies allow to optimize propeller's performances on all speed's range of the aircraft. The E-PROPS have very few parts, all in carbon fibers and epoxy resin. Some comparative tests are showing that ground adjustable pitch E-PROPS propellers are more efficient than some variable pitch propellers on the market. Efficiency is also important, because it increases safety : shorter take-off and better climb rate allows to be faster higher, in order to react more rapidly in case of failure. Carbon braid, HCL process, epoxy resin, RTM manufacturing, electronic bench for balancing, special leading edge protection. It is the first step before the certification following EASA and FAA standards, a guarantee of reproducibility and traceability. The E-PROPS design department is working on many axis to reduce the propellers noise. With their fine and shiny blades, they are very aesthetic hi-tech products. The pilots can take their time to test their E-PROPS, in their own environment, and to make comparative tests with their old propellers. To propose such a contractual garantee since 2008, the E-PROPS team is confident of the performances and quality of its propeller. Now you know the questions you should ask on the propeller, this essential equipment. ADOPT THE RIGHT PROPELLERS, FREELY and WITH YOUR EYES OPEN !